Any guesses as to what a sporting venue’s biggest competition is? The couch! At home, fans can enjoy the game from the comfort of their own couch, eat their own food, and use their own personal bathrooms, and all for a fraction of the price. And, they’ve got instant access to replays, stats, and even other games right on their smartphone! In fact, 57 percent of fans prefer to watch the game at home. So what’s the draw to get millennials off the couch and in your stadium seats? If they’re making the effort to come out to the game in person, they expect to enjoy a unique (and Instagram-worthy) experience that the fan at home is missing out on. And because of this, teams are finding new ways to engage their fans on mobile through super engaging in-stadium experiences. 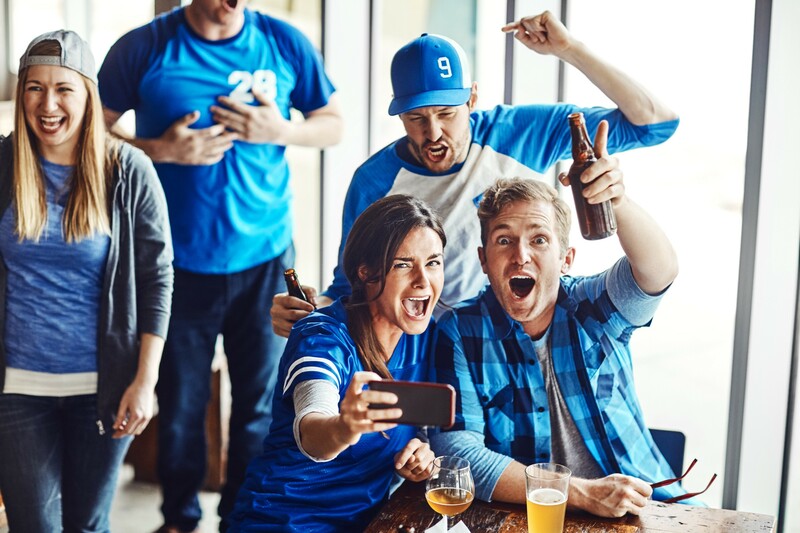 Sports fans are known for their die-hard loyalty to their teams, but if there’s one thing a sports fan loves more than their team, it’s their phone! So why not bring the two together? After all, 83 percent of adultscheck their mobile phones while attending a live sporting event. And whether they’re looking up a player’s stats, or posting a quick pic on social media to make their friends jealous, it’s safe to say that engaging with those millennial fans through mobile is no longer a unique feature, but an expectation. Speedy Wifi: Millennials can be characterized as a lot of different things, and impatient is definitely one of them, and a slow internet connection is something that simply isn’t tolerated among millennials. At college games, fans often leave at halftime if they can’t connect to the internet or upload their photos to social media. So ensuring that your fans have the fastest Wi-Fi possible to post, tweet, or instant message, is crucial to winning the millennial seal of approval. Unique in-stadium mobile experiences: Providing fans with the fastest Wi-Fi is a feature that can come with a rather hefty price tag, the Denver Broncos recently spent $6 million in renovations to enable free Wi-Fi throughout the stadium. Thankfully, speeding up that Wi-Fi isn’t the only option for quick mobile engagement. If you provide mobile experiences as Progressive Web Apps, you won’t have to worry about spotty Wi-Fi or spectrum crunch, because PWAs can run in areas with low connectivity like big stadiums with thousands of screaming fans all trying to connect to the same Wi-Fi…making PWAs everyone’s first pick for unique in-stadium experiences! We’ve even come up with a few fun ways to engage fans using PWA-powered mobile experiences. The President of the New York Jets, Neil Glat, said it best, “The sports fan in 2022 will likely consume additional and more customized sports content through OTT and digital platforms; take advantage of new and better augmented reality and virtual reality offerings; and utilize mobile ticketing, mobile payments, and personalized apps.” The only problem with what he said was the year all of this would be expected, because while he predicted 2022, this is actually expected among sports fans right now in 2018! And by providing these unique in-stadium experiences through mobile, it can help venues get their fans off of their couches, and into the stands! Mobile trends, insights, and best practices.